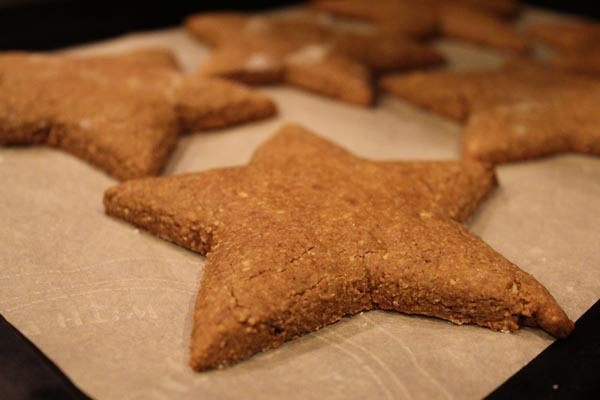 Almond Spice Cookies: Rapadura, Spice, and Everything Nice! Bake up some of these lovely treats for the family this season! 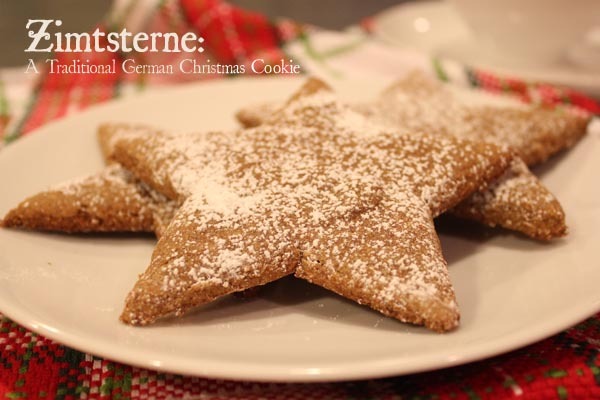 Zimtsterne, which means “cinnamon star” is a traditional German Christmas cookie made with ground almonds and sweet spices. In this version, we sweetened them with rapadura, but feel free to substitute any granulated sweetener instead. There’s no flour in these cookies at all, so they’re perfect for anyone with wheat sensitivities. For an old-fashioned Christmas tree decoration, punch a hole in one of the points of each star before baking them. Then when they’re cool, string a ribbon through the hole and hang the cookies from the branches of your Christmas tree. Parchment paper or a Silpat are helpful for rolling and baking. First, grind the almonds. 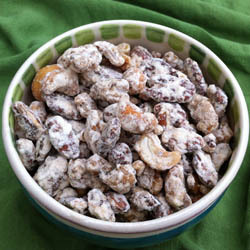 Place 1 cup almonds at a time in a VitaMix or food processor and whiz until finely ground. Be sure to STOP before they become almond butter! Repeat until you have 4 1/2 cups of ground almonds. In a medium sized bowl, combine all ingredients except the egg and rapadura. 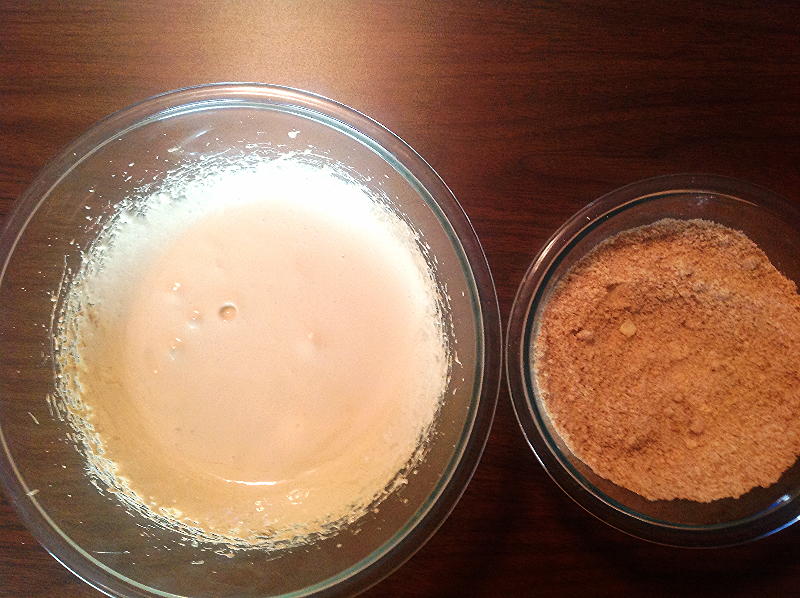 Whisk together, until it is a uniform sandy mixture. Set that aside, and separate your egg whites from the yolks, if you haven’t already done so. Place the whites in a large bowl, and beat them with an electric mixer until soft peaks form. That means the egg whites turn frothy, and when a spoon is dipped into it and drawn out, the egg forms a peak and then falls back over. Add the rapadura or sweetener of your choice tablespoon by tablespoon, beating it in each time. 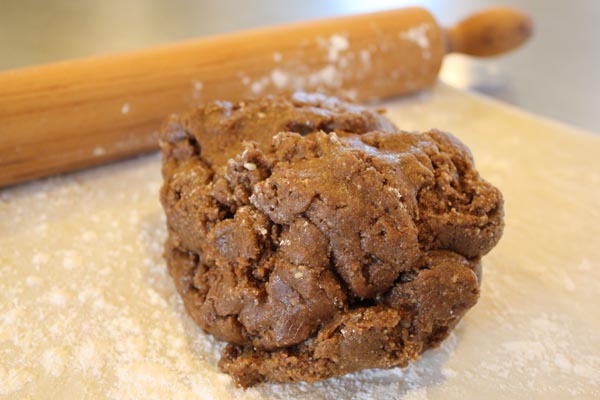 It will make a lovely thick mixture and give the cookies a mild molasses taste. Fold the almond mixture into the egg-white mixture until the two are combined. Let it sit for fifteen minutes to absorb some of the moisture. Once the fifteen minutes are up, your dough should be soft; able to be rolled out without sticking hopelessly to the rolling pin. If you find it’s too sticky, you can a little more almond meal, say, a quarter cup or so, to make it more workable. Go ahead and preheat the oven to 325 F. Now it’s time to roll out the dough. I found it helpful to place a piece of parchment paper or a Silpat on the counter top where I rolled it out so the cookies wouldn’t stick. And I sprinkled a little arrowroot powder underneath the dough and a little more on top. This worked beautifully! Roll the dough to 1/4 inch thick. 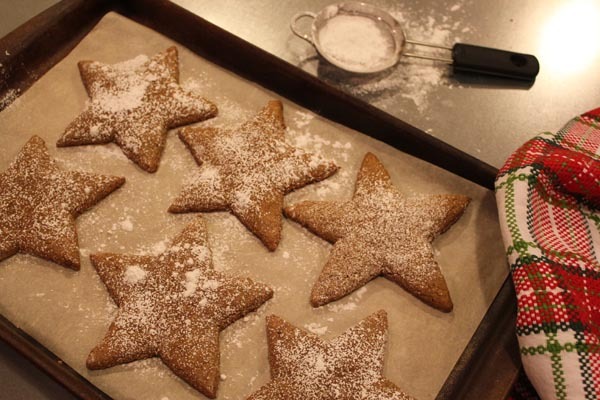 Cut out the star shapes and gently transfer each cookie to a parchment-lined baking sheet. Put the cookies in the oven for 12 – 14 minutes, until they get lightly golden underneath. You want to watch them carefully here and make sure that they don’t over bake so they stay tender and chewy. It’s okay if they seem fragile when they come out; they’ll firm up as they cool, but still be beautifully soft. 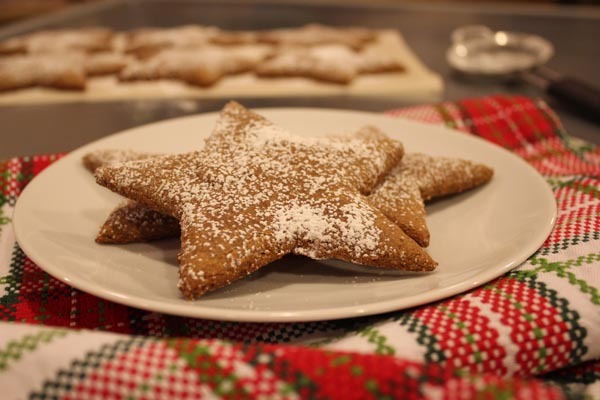 While they’re still piping hot, sift a little powdered sugar over the top of each cookie. Let the cookies rest for a few minutes on the pan, and then carefully transfer them to a cooling rack until they are ready to eat. But knowing the smell wafting through your house as they’ve been baking, that might not be very long. And that’s it for the cookies! As a final note, though, we had company the day I made these. I offered one to our guest, and as she was leaving several hours later, she turned around and said to me, “Those cookies rock.” And yes, ladies and gents. That is a direct quote. I hope you love them as much as we did! Enjoy! I’d really hate to start this message off on a negative note since there are so many positives about Concord grapes, but for the sake of being utterly clear, you must know the facts before you place your order. Concord grapes are not table grapes. The skin is more fragile, and the flesh is much softer. They are picked by the cluster directly into the boxes we receive without any culling process, which is a good thing because it minimizes handling, which reduces the opportunity for damaging the delicate grapes. But because they’re not combed through, some of the grapes may have splitting, you’ll certainly see some leaves and green immature grapes in the box, and the boxes may leak with juice and condensation. Bottom line: Concord grapes can be untidy. We offer Concord grapes once or twice a year, in late September and/or early October. Check our current order form to see if they’re available now, or sign up to be notified when we start taking orders next. The main reason for their popularity is not because folks eat them fresh (although many people do), but because of all the wonderful grape things that people make… homemade wine, grape jelly, artisan vinegar, grape cider, and even just canned purple grape juice, which is easy, fun to make and absolutely delicious. Some of these grape crafters offer their jams, wines, and juices as neat gifts for special occasions. Even this near-flawless box of grapes has a few squished berries near the back left corner and at least one split grape close to the front right. Not every box is this perfect. If you’ve ever ordered from us you may have noticed that a few days after you get your things, you receive an email requesting feedback about your order. Naturally, we are encouraged by many positive reviews that come in, but the negative reviews give us insights as well and help us understand what kind of changes need to be made. This enables us to respond to any problems and to refund folks if necessary too. 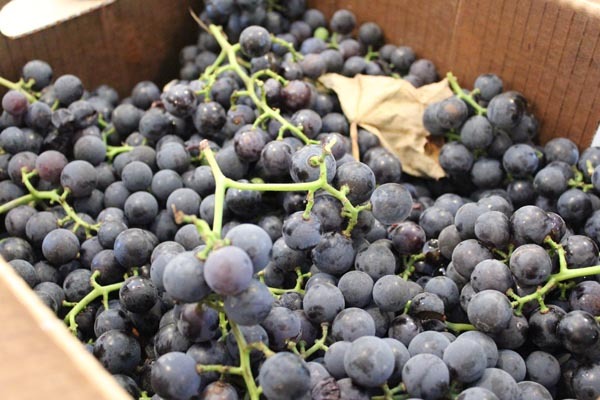 We only offer Concord Grapes once or twice a year in late September and/or early October. And there are many enthusiasts who buy them. These are the kind of grapes that deliver that classic grape taste like nothing else, and a lot of people are wild about them. And yes, they can be drippy and messy, so it’s important to attend to them right away. Some of the grapes may be split, and the bottom of the box may leak juice. 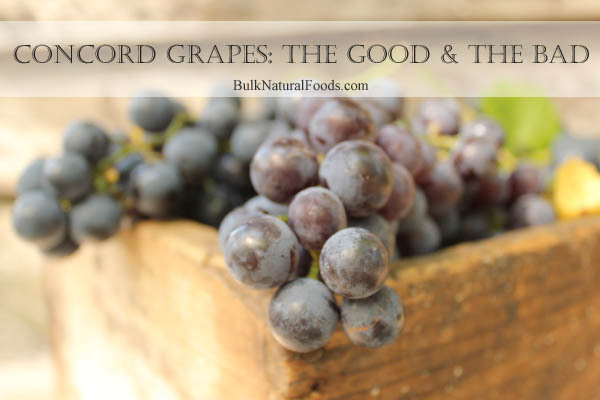 Although these grapes are very popular they are generally not very perfect, so we get a wide range of both positive and negative feedback about them. Here are a few Concord Grape comments from years past. I am loving eating the concord grapes fresh each morning. I washed them in a little vinegar water to keep them firm and fresh. My husband and I are loving eating them. About half of the concord grapes I received were smashed and unusable. We set the box on the kitchen counter, and the juice leaked all over the counter. The order was excellent. We processed the grapes into juice & made jelly after I ate a pound of grapes. Some were split but that is normal. I ate lots of them & they were excellent. The apples are absolutely amazing. God bless your service. I ordered the Concord grapes. They were nowhere near as sweet as last year, and they were much smaller. They were already starting to leak juice everywhere, and smell fermented. I washed them and boiled them down the same afternoon, but have to add sugar to the juice to use it for jam. Last year’s were so sweet and good I could just drink the juice and it was the best I’d ever had. I made jelly without adding sugar last year, too. I am able to use the juice, but I’m sad because I was looking forward to that same wonderful sweetness, and it wasn’t there. …The Concord Grapes were wonderful, too. We washed them, blended the grapes in our Blend-Tec Blender, poured into 8 oz canning jars leaving a little space at the top, and froze them. We will enjoy this very nutritious juice all winter long. I don’t usually complain but there was about 1/3 of the box of grapes that were mushy. When I got home, the box had leaked in the car too. The other two thirds of the box are wonderful and we are making jelly tomorrow.On the other hand, the apples are AMAZING! We have ordered two more boxes for the next delivery. A friend told me about your company and we are thrilled to have found the good quality for fresh fruit. Most of the grapes were crushed and mushy. When I tried to pick out the few good ones, even they cracked also. It was so much work to pick out a handful of good grapes that I eventually gave up. I purchased Concord Grapes and Apples. This was my second order for Concords this year and both were really good. I had almost no waste grapes as I sorted them immediately but this year there were not even many split grapes. I made grape juice in my steam juicer which is incredibly easy. We are Messianic and every Friday evening we celebrate the start of Sabbath and our Messiah with Bread and Grape Juice. I have canned enough homemade Concord juice for one small jar for each week of the year. Once again–love the grapes! Made wonderful freezer jam with them, and are we are all enjoying just eating them fresh too. The concord grapes were wonderful!! I have made 10 pints of grape jam and 4 gallons of grape juice concentrate! So yummy!! I ordered two kinds of apples and some concord grapes. The apples are wonderful and I’ve been making applesauce and we are eating them also. This is the first time I’ve ever gotten concord grapes and I am not really impressed. They spoil very quickly! I did make jelly with about a third of them and I am hoping to use the rest for juice today, but I did already have to throw many out because they were molding quickly. I am guessing that this is just how grapes work since they are such a soft fruit… I probably wouldn’t order them again since they are hard to use that quickly! About a half of the grapes were “cracked” and mushy. I have purchased grapes for about 3 years and they have never been this messy.The grape juice had leaked through the container box making it sticky and messy. We had to wipe the box dry before we could pick it up. The grapes were fantastic! There were some mashed ones, but no more than expected. They taste delicious, and have made fabulous juice and jelly. I shared some with family to make jelly, and they are equally as thrilled. … by the way, the grapes this summer made the BEST jam. First time in 40 years we made wild berry/grape jam! I have also made a lot of Low Sugar Concord Grape Jam using Pomona Pectin. My children will eat this in endless PBJ sandwiches that they love so much. We had some friends over for lunch today. We had a Mexican dish, then afterwards I put some grapes and cookies on the table. The guy grabbed a grape, ate it, and said, “”WHOA! These grapes are AMAZING!! I have NEVER tasted grapes like that before.”” The wife had one and she loved it too. They had a few more, and a few more, and enjoyed them immensely. I told them they were Concords. They said now we know what kind of grape to look for. They’re from Louisville, and she said she thought there was a co-op there, so she would check it out. There is just nothing like a Concord. My kids were so excited when I came home with the grapes, and have been enjoying eating them very much. And I made several jars of grape freezer jam so we’re looking forward to enjoying that as well. Concords are always a huge hit around here. Thanks so much for making them available. My order was perfect. I got grapes and apples. There was not 1 bad grape in my order and the apples were just perfect. Thanks for what you do. Beautiful grapes and apples!! I have been slow about doing anything with them, but plan to dehydrate the apples and make some pies and jam with the concord grapes. We have been enjoying them raw…yummm! And we are happy with the Ottos, who have them ready for us on pickup day! We Want You To Have A Good Experience With Grapes! 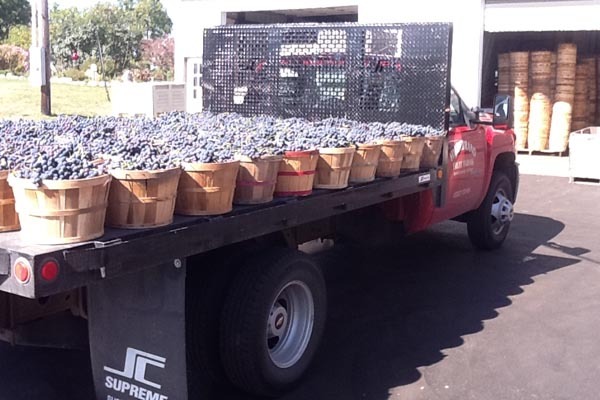 Of course, we’d like to sell a boat load of Concord grapes. But more than that, we want you to have a good experience with what you order. An excellent experience. We encourage you to order grapes if you want ‘em as long as you understand what you’re getting: hand-picked purple grapes that may contain some split, leaky skins… potentially messy, but they have equally been known to generate some of the most enthusiastic “oooooo’s” and “aaaahhh’s” and “yaaahhh-baby’s” we’ve ever heard. On our end, we will continue to pursue feedback about your experience with the Concord grapes and other great stuff we offer. And we won’t be difficult to work with if refunding is needed. Just-picked grapes returning from the field in Michigan. Last week, Bountiful Blessings Organic Farm asked us to spread the word about an online webinar they’re going to be hosting this Thursday, August 28th. If you’ve never been to a webinar, just think of it as a local seminar that you watch live on your computer. You’ll especially enjoy the interactive question and answer session where these seasoned organic growers share their knowledge, tips, tricks, and wealth of experience with YOU. If you know anyone who is interested in growing organic, nutrient dense foods, please be sure to let them know about this. Register today to join Paul’s webinar this week Thursday, August 28th! Please help us spread the word this week about this webinar. Bountiful Blessings does a very nice job and we think it will be worth your time to attend. When you share this video tour of their farm, be sure to include the link above so your friends and family can register if they’d like to attend. This elongated European plum is a bit different from plums you’ll commonly find in stores. The Stanley plum is often used for canning, jams and preserves, drying, and baking, especially traditional European dishes. Stanley Plums are sweet-tart and so full of flavor, we love to eat them fresh, and we can’t get enough of them when they’re baked in a crumble like this one. 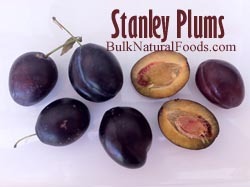 This is the only time this season that we’ll offer Stanley plums. 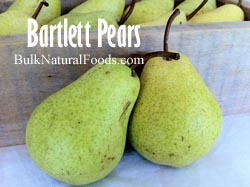 One of the juiciest pears you’ll find, we love the Bartlett for it’s outstanding flavor. Bartlett pears are great for canning, and if you’re careful to put them in the fridge when they’re still hard, they can be stored fresh like that for a few extra weeks. We’ve had good success storing ours for about a month in the fridge. Unlike most other fruits, pears are best when picked green (unripe) and allowed to ripen off the tree. Otherwise they become mealy. Our pears are picked mature, but green, so you can store them under refrigeration and ripen them when you’re ready to can them or eat ’em fresh. 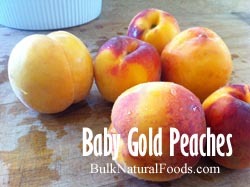 Baby Gold peaches are a classic for canning. They’re unique in that they stay nice and firm when you can them. Ever have store-bought canned peaches? You know the way they feel in your mouth when you bite into one – firm, but soft, and almost a little chewy? Well, those are made from cling peaches like these. You’ll need a sharp knife or spoon to cut the pit away from the flesh, but patience has its rewards… Come mid-winter, those pretty canned peaches will make a lucky fellow a nice breakfast or dessert. New to canning? This blog post is one of the most helpful guides we’ve found on canning peaches. 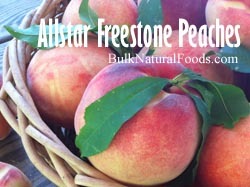 As the name implies, freestone peaches have a pit that comes away from the flesh easily. These really are the very last peaches of the season. If you need to fill a few more bags for your freezer supply of fall smoothies, this is your last chance. 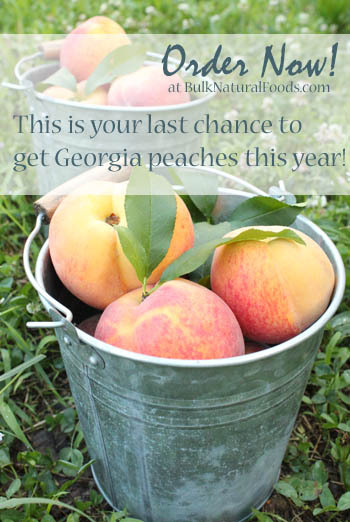 There’s still time to order Georgia peaches for July! We’ll be bringing in this last truck load, and then that’s it for the Georgia peaches this year. Order now! You’ll also find all kinds of dry goods on the order form to re-stock your pantry: whole grains, flour, dried fruits and nuts, natural oils, beans, and some handy food storage containers like glass gallon jars, 5-gallon pails, and gamma seal lids in an array of bright colors. Deadline To Order Peaches: Monday, July 21 at 9:00 a.m.
We recently sent out an email requesting feedback from those who had ordered peaches on the last order to help us decide whether to have another Peach Order. It was pretty clear from the feedback that the answer is YES! 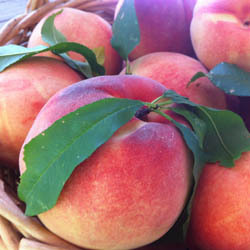 Most said their peaches where AWESOME and can’t wait for the next truckload. Many said they had a few bruised peaches to deal with but they felt that got a good value and would do it again. A few had a bunch of preaches that where very bruised. The majority of negative complaints are from people who did not get to their peaches right way. First of all, we will be sending out refunds to those who requested refunds. We also called the peach orchard and discussed the bruising problem with them. We’ve come to find that the terms for their “number 2” peaches can be pretty broad. We were told we need to accept that their number 2 peaches may have some bruising. It was also made clear that peaches have a relatively small window of time between ripe and over-ripe; and of course peaches with any bruising will narrow this window even more. As we’ve come to terms with the farm’s position on number 2 peaches, it’s important to properly set your expectations about the number 2’s. After a little pondering, we decided to re-name them “Number 2 culls”. “Culls” are the ones that have been rejected as number 1’s for any number of reasons, including some amount of bruising.If you’ve been buying these “number 2’s” from us, and you’ve been happy with them, it’s possible you’re the kind of person that babysits your peaches, and process them as soon as they ripen, and you will deal with a certain amount of bruising. Or it may be possible you’ve been lucky to receive near-perfect-number-2’s because many of them can be described that way).Either way, it is our place to make sure we represent the product properly so that you can make a good buying decision and your expectations can be reasonably met. We want you to be happy with your peaches. Although this may cast an uncertain shadow on the popular “Number 2 culls” we do need to be clear that the farm now says they may have some bruising.If you want peaches for fresh eating, order the #1 peaches. They are truly the cat’s pajamas of peaches.On the other hand, if you’re going to be processing your peaches right away, and you’re willing to cut around any possible bruised spots, then the Number 2 Culls are a very popular choice. Your Part: Please make sure to look over your peaches as soon as you get them. Freeze them, can them, eat them with your neighbors or bake a bunch of cobbler. Just remember the clock is ticking when peaches enter into your life.Our Part: We take great pains to accurately represent the items you get. And overall, we do a good job.But we do work with many farms around the country and there are times that the farm sends something that’s less than acceptable. If you ever receive something from us that is not satisfactory, please let us know so we can make it right. Number 2 cull peaches may contain “some” bruising but we won’t be idiots about refunding you if you get a really bad box of number 2 culls and you’re not satisfied. CLICK HERE to order PEACHES! Click here to be notified when we’re taking orders for peaches or check our local order form to see if they’re available now. 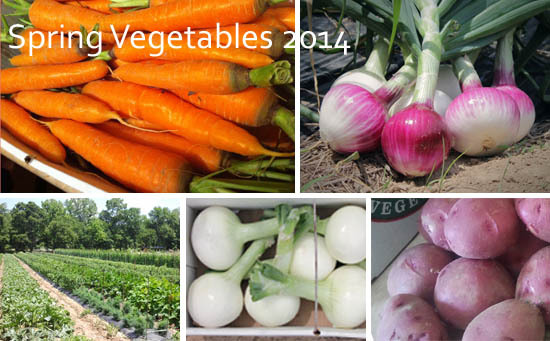 These vegetables have been added to our Maple/Cod Liver Oil/Dry Goods order form. Vegetable pick up is at the same time and place as these other items. If you need to add vegetables to an order you’ve already placed, this quick tutorial will show you how. 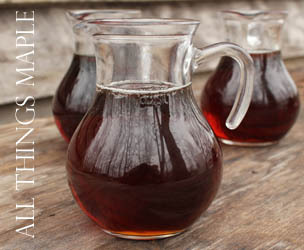 Vermont Maple OrderJust a few days left to order organic Vermont maple syrup and other maple goodies! We only take orders for this incredible syrup once a year! Deadline To Order: 6-5-14 at 8:00 a.m. Order Here for Local Pick Up Have your order shipped here. What’s Up With Grade B Maple Syrup? Grade B maple syrup is notorious for its deep, rich maple flavor, and some claim it even has a higher mineral content than the lighter grades of syrup. 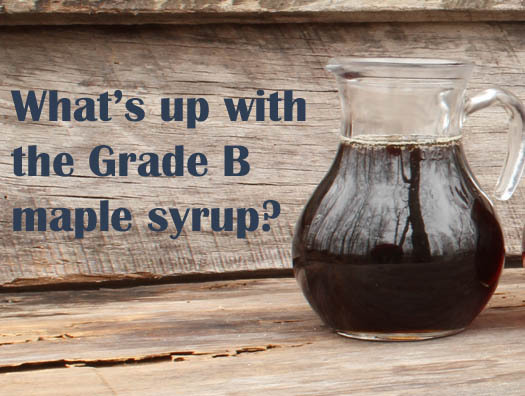 What makes Grade B maple syrup special? The sap that is harvested toward the end of the sugaring season is much lower in sugar and higher in water. To make syrup from this watery sap, more is required. For our grower, Lee, that means about 80 gallons of sap are needed to make one gallon of syrup. Because it is so much more concentrated, this late season syrup is the darkest, most richly flavored syrup you can buy. This is the one formerly known as Grade B.
Grade B maple syrup had a legal name change this year. There has been a new naming convention in the works for several years now, and this year, the state of Vermont (where our syrup comes from) legally accepted the new grading system. Legally, all maple producers in the state of Vermont now have to comply with the new grades. What used to be called Grade B is now called “Grade A Dark with Robust Taste.” Or simply “Dark” on our order form. 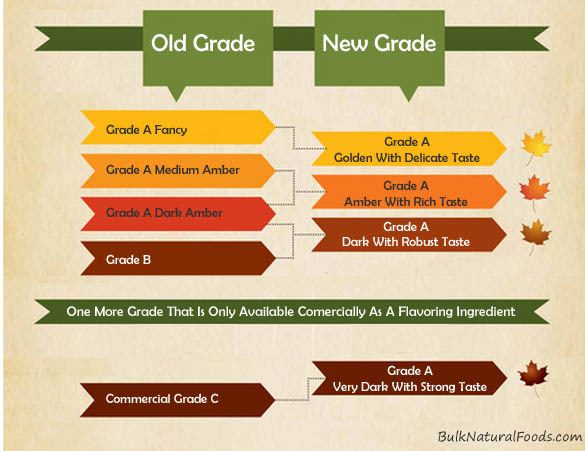 The new grading standards and names were basically designed to bring Grade B maple syrup back into favor with the general public. 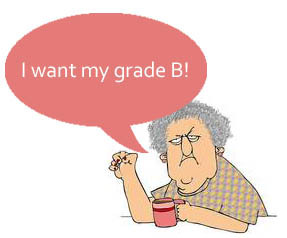 The label, “Grade B” has a negative connotation to some people. After all, would you buy grade B beef or grade B vegetables? There is one other reason for the new names, and that’s to avoid confusion on an international level. Up until now, the lightest colored syrup was known as “light,” “fancy,” or “light amber” depending on the state or country where it was produced. The new naming standards will make sure everyone is talking about the same thing, even across international borders. In the long run, we think this is really a very good change. In the meantime, it’s making a lot of people grumpy. Since four grades have merged into three, there’s some overlap in the flavors. Check the chart below to see how the grades compare. If you liked the Grade B, the “Dark with Robust Taste” will be your comparable favorite. Other Special Maple Products Available Now! Maple Cream: Spread it on bagels, toast, or English muffins (a homemade egg “McMuffin” with sausage and maple cream is an extra special on-the-go breakfast), swirl it in ice cream, use it as a stand alone filling for sandwich cookies or a topping for cupcakes. 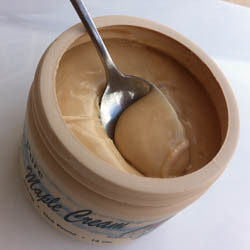 Maple cream is 100% pure maple syrup that has been heated to 232° F, then rapidly cooled to room temperature. Then it’s stirred until it develops a creamy texture. Keeps in the fridge for at least a year. Frozen, even longer. View order form for more details. 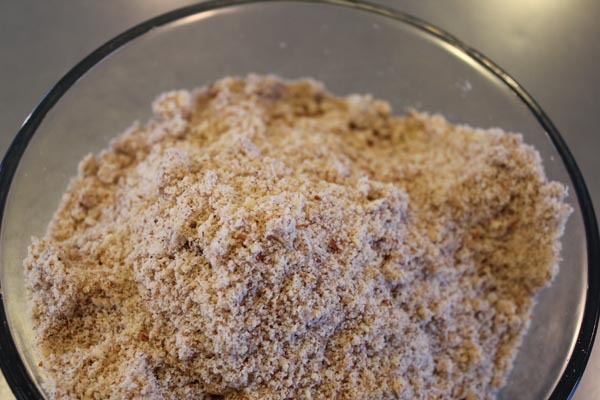 Maple Sugar will impart a special maple flavor when you substitute it in any recipe that calls for brown sugar or granulated sugar. Here are three of our favorites: maple sugar shortbread cookies, maple sugar peach crisp, and maple sugar cake. Maple Sugar is made by boiling maple syrup until the temperature reaches 260° F then immediately stirring until it granulates. 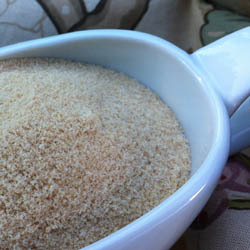 The sugar is sifted to make a uniformly sized product. Larger pieces can be great to eat like a natural candy or sprinkled on hot cereals. We like it on fresh fruit too! View order form for more details. 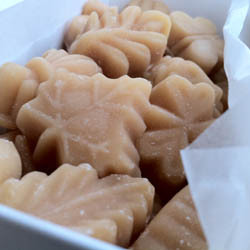 Maple Candy: A special treat that melts in your mouth! To make this special, natural candy, the grower boils maple syrup to concentrate the sugars, then they cool it to just the right temperature before they hand stir and pour it into molds. As it cools it hardens into the favorite, all natural candy of the north east. Ingredients: organic maple syrup. No preservatives or additives – use within 6 weeks or freeze to enjoy later. View order form for more details. These maple nuts are my personal favorite of all our maple goodies. There are no peanuts, just walnuts, pecans, cashews, and almonds – and pure maple syrup. Although maple nuts are probably great in recipes, we think the best way to eat them is out of hand, just as they are. Great as a party food or a special family night. We highly recommend that you stash an extra bag of these in the freezer, and save them for a Christmas party. View order form for more details. Do you know the benefits of taking cod liver oil and high vitamin butter oil? Do you want your kids to take it, but you’re just not sure they’ll like it? 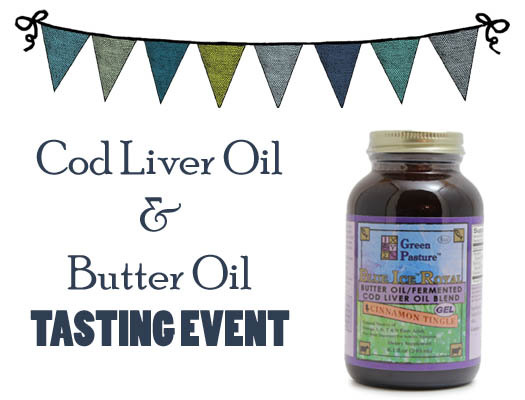 Bring the whole family out this evening to sample several different flavors of Green Pasture’s cod liver oil and butter oil to see which one you like best! It’ll be fun and give you the confidence you need to order the flavor your family will love. We’ll be on the side of the building that faces James W. Ayers Drive. WHO: Your whole family is welcome to come and taste! Feel free to bring a friend. FYI: We will be video recording everyone tasting the different flavors tonight to get some candid feedback on which flavors people like best. The video will be edited and posted on Bulk Natural Foods later on to help others decide what kinds of cod liver oil and butter oil they’d like to try. If you don’t want to be on video, no worries. Just let us know and we’ll edit you out. P.S. My mobil number is 931-623-9873 in case you need to reach me tonight. We have so many fun things to share with you this spring! Here’s an update on what’s coming. Also, if you haven’t already, place your order now for dry goods. The deadline to order is this Thursday morning at 9:00. Deadline To Order: April 17th at 9:00 a.m.
As we mentioned last night, we will be ordering from our vanilla supplier today in just a little while. So the sooner you get your order in for any of these special vanilla items, the better. After sampling many different brands, we believe the Singing Dog Vanilla extract is one of the best there is. But we’re eager to know what you think too. Order yours now and take part in our Great Vanilla Search just by offering your feedback once you’ve tried it. The especially cool spring weather has presented our maple grower with a later-than-average harvesting time. So our organic maple order will be later than usual as well. Right now, it looks like the delivery dates for maple syrup, maple sugar, maple candy, and maple nuts will be in early-ish June. 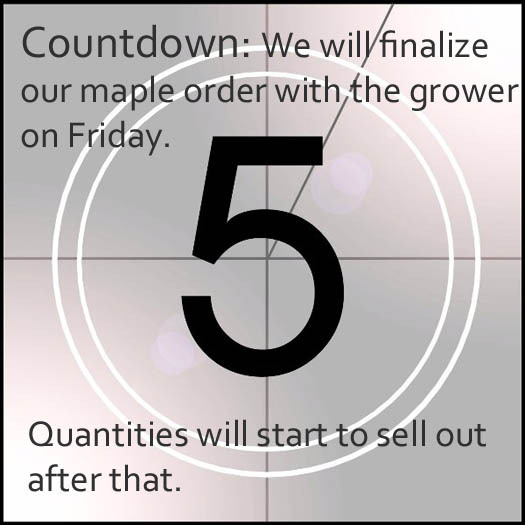 Although it won’t be delivered until June, we plan to start taking orders for all things maple sometime next week.ates for maple syrup, maple sugar, maple candy, and maple nuts will be in early-ish June. You, we, and everyone else has been anxiously awaiting our bulk Rapadura whole organic cane sugar, so here’s an update. It has taken F.O.R.E.V.E.R. for the ship to carry our rapadura from Brazil, where it is harvested and processed, to the U.S.A. And even after it arrives here in the states, it has to be inspected and also receive clearance from customs before we can pick it up at the dock and truck it to Tennessee. The rapadura has arrived in the states, cleared customs, passed inspection, and is ready for us to pick up. Now, the only question is WHEN it will arrive here in TN. We hope it will be delivered in time for our April delivery. If not, then it will certainly be available on our May order form. Green Pasture, the supplier of our cod liver oils and butter oils, is careful to maintain equal pricing on their products for everyone. No matter where you buy your Green Pasture cod liver oil and butter oil, the price is the same. But we’ve been given special permission by Green Pasture to make a high volume purchase, and pass the savings on to you this May. 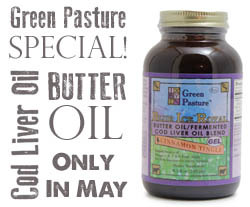 This order will include Green Pasture’s famous fermented cod liver oils and their butter oils in many different flavors. You can also have your regular priced cod liver oil or butter oil shipped directly to your home anytime through this link. The shipping is on us. We’re still working out the details, but in May, we plan to offer a nice selection of fresh tropical fruits. Keep an eye out for our emails on this one. We’ll know more soon. Peaches will be later this season; we’re thinking late June. What happened to the May peaches? There are peach trees that bear fruit in May, some that bear in June, and others that bear in July. And just as you’d expect, the trees that bear fruit in May bloom sooner than those that are ready for harvest in June or July. All over the southern, peach-growing states this spring, the weather warmed enough that the May bearing peach trees bloomed a few weeks ago. But just after the bolssoms had been polinated and the fruit had begun to grow, there was a cold snap, and the delicate new fruit was frozen and ruined. So there will not be any peaches available to us in May. Mind you, there should be plenty of peaches in June and July. It’s only the May bearing trees that were affected by the frost. Livestock feed will be available to order for pick up on the following dates. The order form for the May delivery dates will open soon. SAF yeast in 1 pound bricks is 1/2 price on our dry goods order form! So stock up now!